Why Should Your B2B Company Build a Presence on Instagram? Contrary to popular belief, Instagram can be a highly effective marketing channel for B2B companies who cater to more mature audience segments. According to Pew Research Center, 40% of all internet users ages 30-49 are on the platform. And because Instagram’s user base is continuously growing, the target audience for B2Bs is also expanding, providing even more business opportunities. In addition, the competition among B2Bs on Instagram is low. With only 30% of B2B companies leveraging Instagram for content marketing, there’s plenty of room to stand out and reach your audience. While Instagram isn’t a sales-driving channel for B2Bs, it can help you strengthen your brand image and awareness. Here’s what you should be posting on Instagram to help meet these objectives. Positioning your company as a thought leader is essential in the B2B market because it has huge potential to build credibility and drive sales. According to LinkedIn, 82% of B2B decision-makers say that thought leadership has increased their trust in an organization and led them to award business to a company. One of the most effective ways to establish your reputation as a thought leader is to share your niche expertise using exclusive, relevant data. 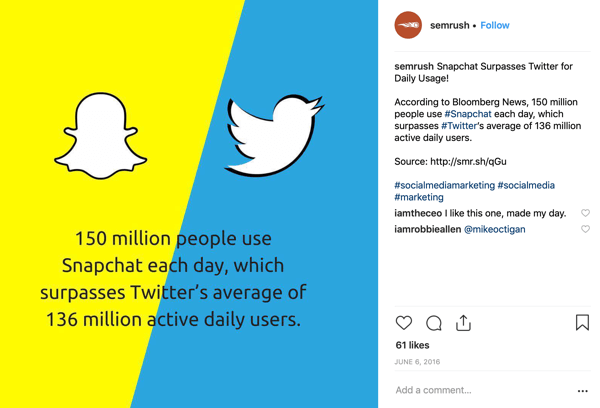 Publishing infographics and data-packed videos on Instagram can help you make dull-looking data points appear attractive on the visual-centric platform. 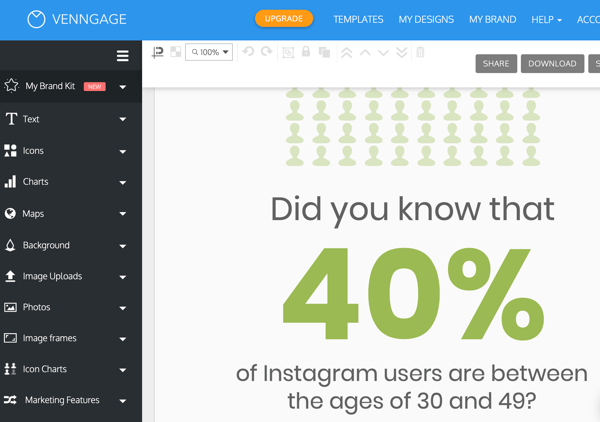 Venngage is a free infographic maker that allows you to create eye-catching infographics quickly and easily. After you log into the app, you see a selection of recommended infographic templates. 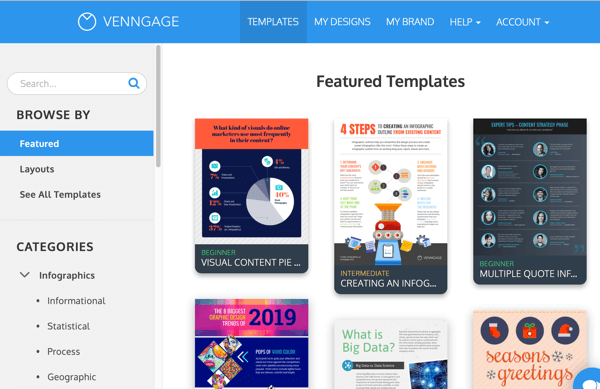 Venngage offers templates for beginner, intermediate, and advanced users, depending on how experienced you are in graphic design. Select one of the featured templates or look through the Categories section in the left-hand menu. 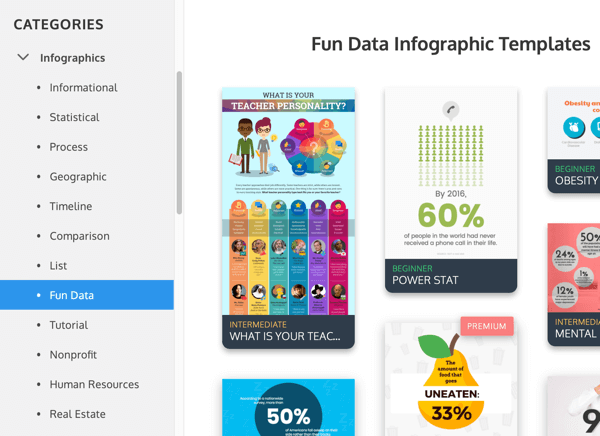 You can choose from a variety of infographic categories, including Informational, Statistical, Geographic, Timeline, List, and more. 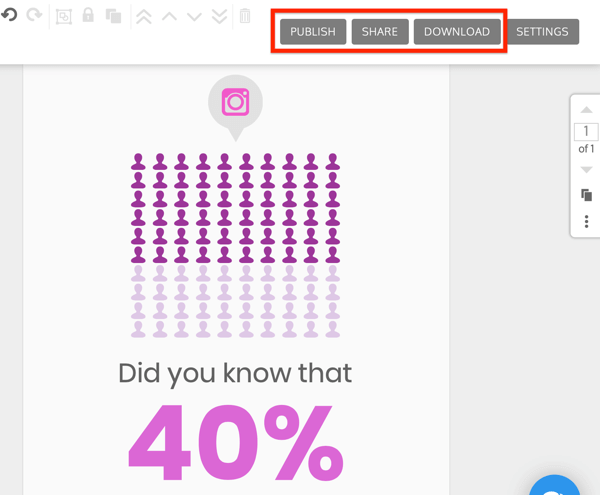 After you select the infographic template you want to use, click the Create button to start building your infographic. 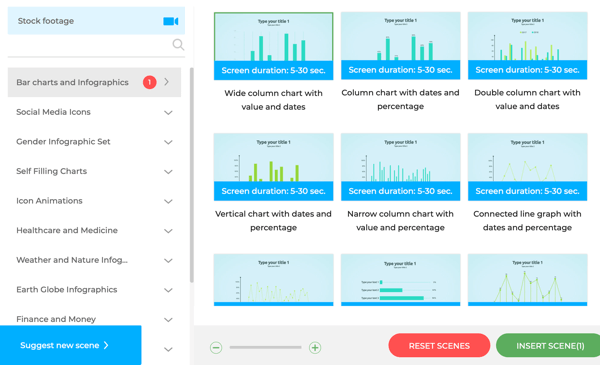 You can customize your design by adding different widgets from the left-hand menu such as icons, charts, or maps. You can also add text overlays, edit the background, and upload images from your computer. When you’ve finished your design, you can download the infographic to your computer, or if you have a premium account (which start at $49/month), publish it directly to your social media profiles. Another, perhaps less obvious, way to present data on Instagram is through videos. 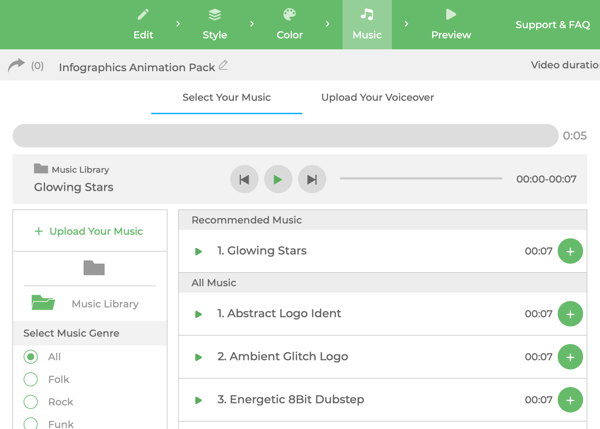 The Renderforest app makes it easy to develop highly customized videos using templates. It’s available in both free and paid plans (starting at $14/month, billed annually). 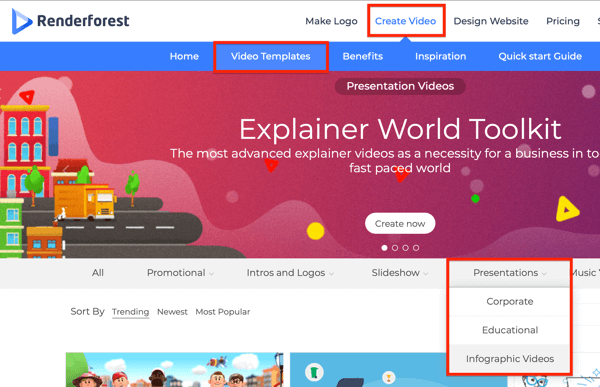 To get started, click the Create Video tab at the top of the screen and then choose Video Templates to see all of the available options. To filter the list to view only the infographic video templates, click Presentations and select Infographic Videos from the drop-down menu. Now you see all of the templates in the category. 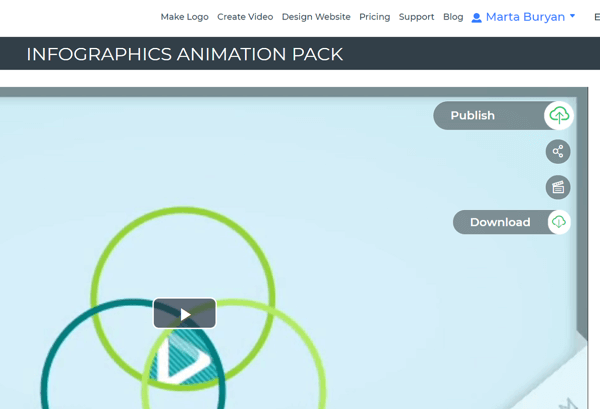 Select the template that best fits your needsto begin the video creation process. The next page shows some videos that have been created with the template. Click Create Nowto proceed. 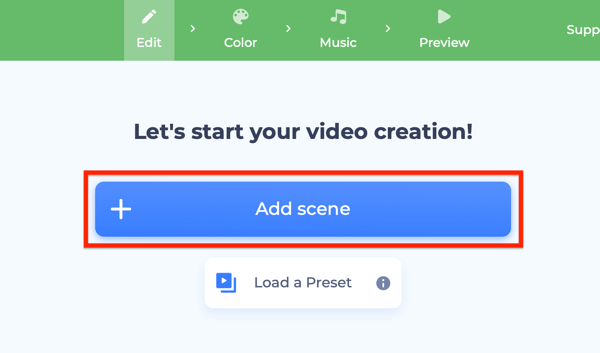 Now click Add Scene to start building your video. 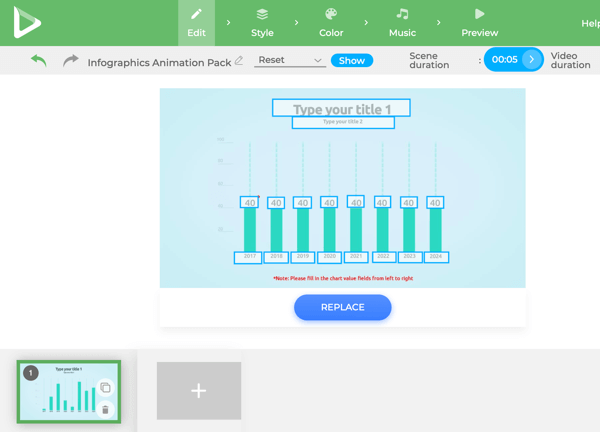 If you chose the Infographics Animation Pack template, for instance, you’ll see a set of screens featuring different chart formats and animations. Start by inserting scenes that best illustrate your point. Click to select a scene and then click Insert Scene to add it to your video. You can customize the text and upload visuals from your computer for each scene. Renderforest also lets you edit the style, color palette, and music for the whole video. You can even add your own voiceover. How cool is that? Tip: Keep an eye on the Video Duration value (in the upper-right corner) to make sure your video is the right length. Instagram videos can be up to 60 seconds for the news feed and 15 seconds for stories. Once you’re satisfied with your video, click the Preview button to start the rendering process. When it’s done, you can download the video. Now let’s look at how one B2B company positions itself as a thought leader by sharing insightful data posts on Instagram. Be efficient. When presenting data on Instagram, stick to the “less is more” rule. Minimize the number of stats visible in a single image or video scene to make your content easy to digest and read. Provide context. Don’t just shower your audience with numbers. Always explain what the data means and why it’s important. Use contrasting colors. Make sure there’s a strong contrast between the background color and stats color to make the post more readable. What if you don’t have exclusive data, yet would still like to show that your business stays on top of the industry’s trends? Curating content can help you enhance your B2B’s brand image. It helps show you’re up to speed with what’s happening in the industry, demonstrating you’re involved and savvy. Second, it will position your brand as a reliable news source that provides value and educates your audience. Here’s how to find relevant content to curate on Instagram. Google Alerts is a free tool that lets you easily monitor the web for interesting topics. To get notifications about new, relevant content, you need to create your alerts based on keywords. Let’s say you want to monitor the web for social media marketing news. In this case, type “social media marketing” into the search bar and click the Create Alert button. Your alert will appear in the list below the search bar. Click the pencil icon to tweak the settings for your alert. Choose the alert frequency (as it happens, at most once a day, at most once a week); select sources (blogs, news, web, etc. ); and specify the language, region, volume, and delivery method. You can also see a preview of your alert below the alert specification window. Once your alert is set up, you’ll receive regular notifications about the topics of your choice on your email address. Another effective way to curate content is with the freemium content curation service Scoop.it. Scoop.it offers a free plan, with paid plans starting at $17.99/month. After you log into the platform, type in the keyword of your choice in the search box in the top-right corner to see all of the content feeds around that. Choose a content feed to view posts curated by Scoop.it users. To further narrow your search, use the filtering function next to the feed’s name. In this case, I typed in the “Instagram marketing” keyword into the search bar to see a more specific group of posts about the topic. 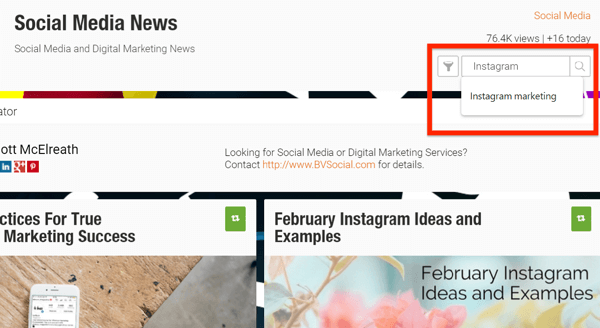 After you discover an interesting, relevant article with Google Alerts or Scoop.it, you need to transform it into content suitable for Instagram. To do that, turn key textual information into appealing visuals such as infographics, videos, or images. Just make sure you give credit to the content source! SEMrush, a competitive intelligence suite, knows how to curate content on Instagram in the right way. In the post below, the company highlighted a key data point from an article by Search Engine Journal. With this content, SEMrush proved they stay abreast of the news and want to educate their audience, which helps upgrade their brand image. Stay relevant. Always align your curated content with your audience’s interests. Be timely. Curate content shortly after it’s first published to make your posts fresh and join the current conversation. Align the curated content with your visual style on Instagram. Make it a seamless part of your content strategy. Featuring your clients’ success stories is another effective tactic for establishing credibility and trust with your audience. These stories help you send a clear message that you’re a legitimate business helping real-life clients succeed. What’s more, they can be a powerful sales catalyst. Here’s how to showcase client success stories on Instagram. The simplest way to show off your clients’ success is through images containing quotes. Browse your client quotes repository and select the most pertinent quotes. If you don’t have such a repository, reach out to your clients and ask for their feedback regarding your products or services. Keep in mind that your clients’ quotes should be short (between 15 and 25 words) to fit into an Instagram image. 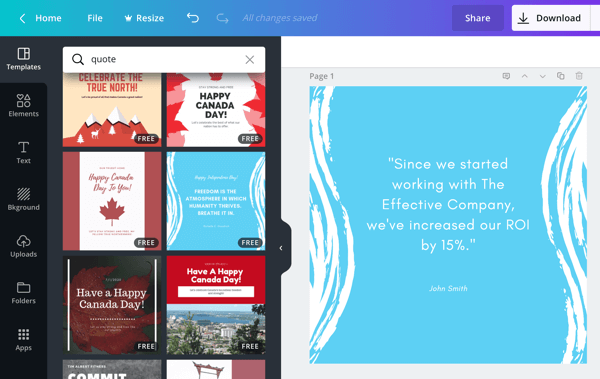 Once you’ve collected your quotes, head over to the freemium graphic design tool Canva to create your images. After logging in, you’ll see a collection of social media image templates. Select the Instagram Post template. Now you’ll be able to either create your image from scratch or select a quote image layout from the left-hand menu. The layouts are flexible, so feel free to customize them so they align with your brand image. Once your image is ready, add compelling descriptive text to your post that will give a more detailed picture of your clients’ success. Provide details. Explain why the client chose your company, what areas your business helped them improve, and what results you enabled them to achieve. Feature data points. Data adds credibility to your story, so make sure to include it in your post captions. To illustrate, reveal how much your client’s ROI has grown since they started using your products or services. Use the right hashtags. Adding hashtags to your Instagram posts helps you boost visibility and reach new audiences. 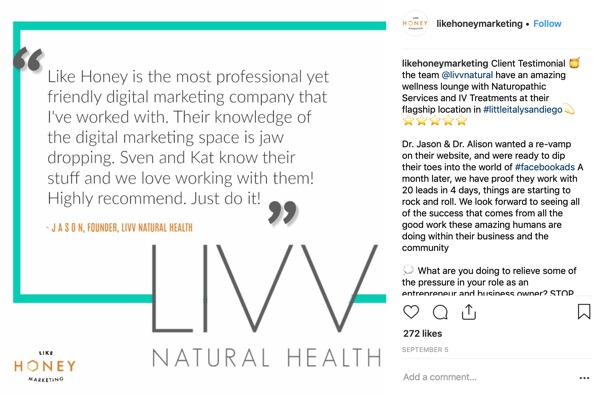 Some of the most popular Instagram hashtags for client success stories are #clienttestimonial, #clientsuccess, and #clientquotes. A B2B company that has mastered the art of sharing client success stories on Instagram is digital marketing agency Like Honey Marketing. They frequently share client testimonials on their Instagram profile, helping boost credibility and attract prospects. Be consistent. Building a reputation as a reliable business takes time, which is why you should publish success stories on a regular basis. To visualize this, make it a habit to share one client testimonial a week. Make the testimonials stand out. Use a distinct design for Instagram posts featuring client success stories to help them stand out in your news feed. Tag your clients. Include your client’s Instagram handle in your posts to demonstrate you’re helping real people, which will boost your credibility. 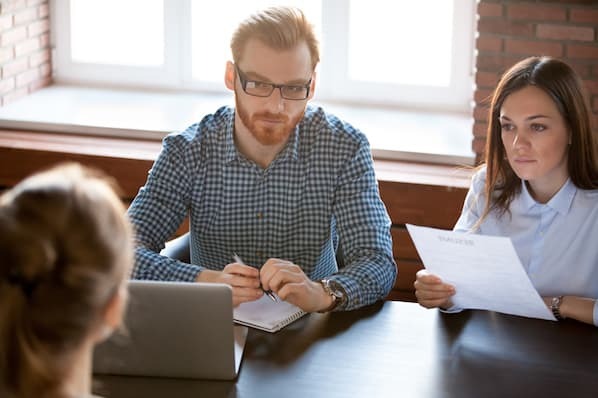 Tapping into employee advocacy has a number of benefits for B2B companies, from maximizing reach to improving brand awareness. Here’s how to make your employees’ authentic voices part of your Instagram content strategy. Shining a spotlight on your employees allows you to showcase your top talent and put a face to your brand’s name. And what better place to feature your employees’ photos than Instagram? 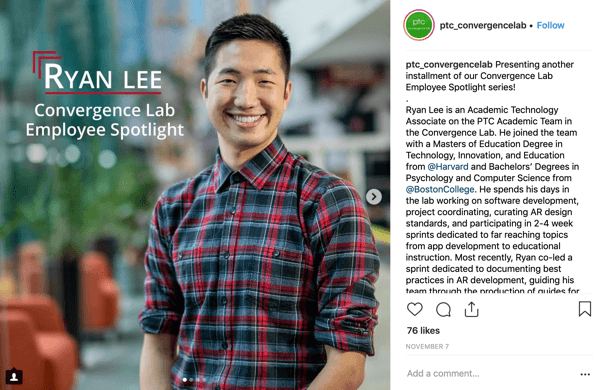 PTC Convergence Lab frequently features employees on their Instagram account to demonstrate the company is comprised of top-notch experts. Start by selecting people who are key to your business. Then think of what you want to highlight about them that will help you present your team and business in the best possible light. Focusing on your employees’ educational background, work experience, and success in your company is especially effective. Next, create a compelling story about your employees and pair it with appealing images you can create with a tool like Canva. 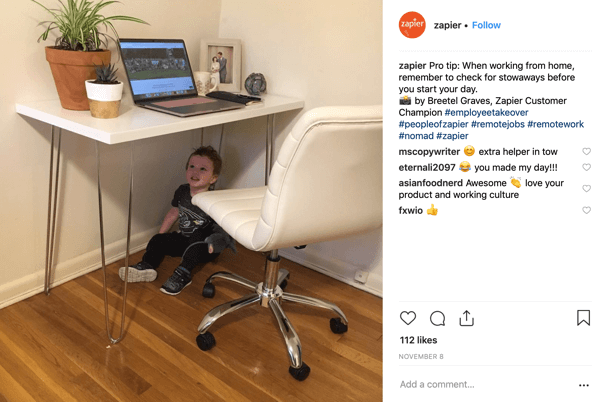 Make sure to add some of the popular employee advocacy Instagram hashtags, including #employeeappreciation, #employeerecognition, #employeespotlight, #employeeadvocacy, and #employeemotivation. Instagram takeovers are a fun way of showing your company through your team’s eyes and demonstrating you don’t take yourself too seriously. Instagram posts published by Zapier’s employees make the company’s news feed more diverse and personal. But before you let your employees publish to your official account, define the parameters of the takeover. How long will it last—a day, a week? What’s the theme—behind-the-scenes, company events, team members? 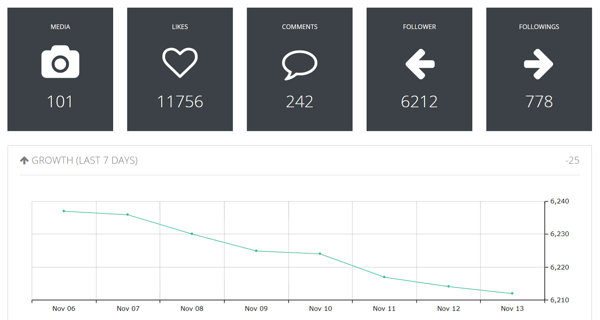 What are the KPIs—increase in followers, likes, comments? Answering these questions beforehand will help you ensure your Instagram takeover will be a success. Tip: Announce your Instagram takeover in advance to encourage people to follow your profile. To get your employees to post about you on their accounts, you need to make the process as easy for them as possible. This means you should equip your employees with all necessary assetssuch as photographs (arrange a photo shoot for them), copy template, and branded hashtags. 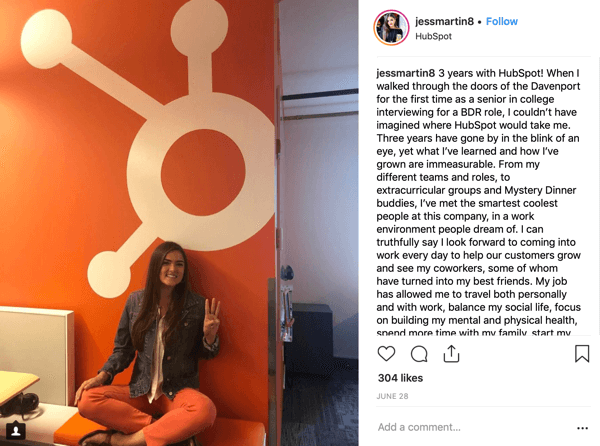 Marketing and CRM software platform HubSpot created a catchy branded hashtag, #hubspotlife, that their employees use to promote the company. The first step to reporting on your Instagram content strategy is to look at brand awareness metrics: engagement, reach, and follower growth. These will allow you to assess the effectiveness of the tactics discussed above and understand whether you’ve positioned your brand in a way that’s attractive to your target audience. To access these metrics, head to the Insights section of your Instagram profile. To do that, tap on the collapse menu button in the top-right corner of your app and select Insights. 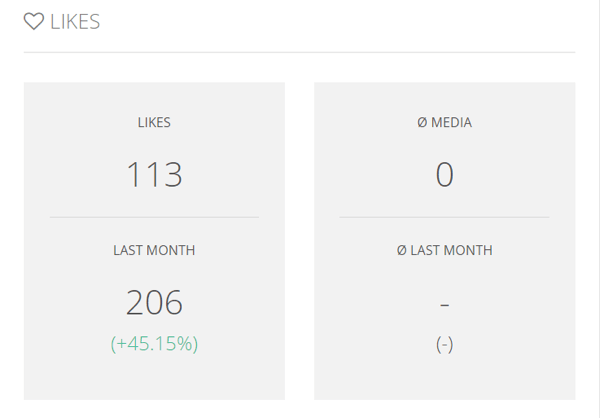 In the Activity section, you’ll see a weekly overview of engagement and reach, along with profile visits and impressions. To check up on your follower growth, go to the Audience section where you’ll see your total number of followers compared to the previous week. Obviously, the higher your numbers, the more successful your strategy is in building a positive image of your brand and boosting brand awareness. 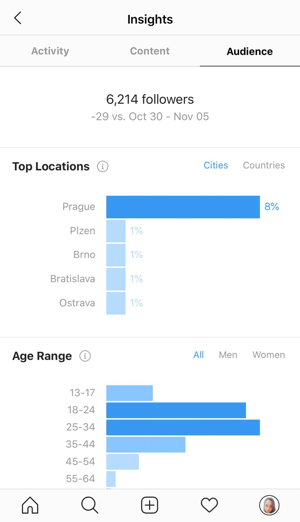 Because the data available in Instagram Insights is limited to a week, you might want to get a deeper insight into your performance. 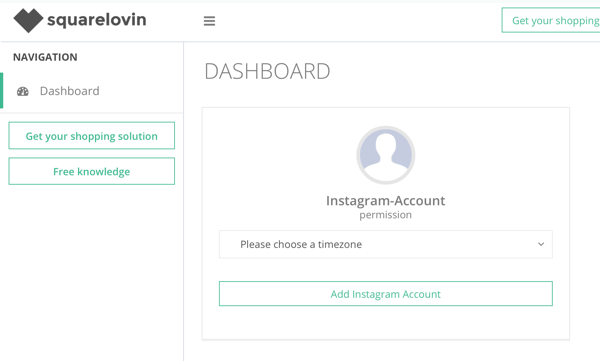 To do that, use the freemium Instagram analytics tool Squarelovin. After you set up your Squarelovin account, log in to see your dashboard. Next, connect the Instagram account you’d like to track. After you’ve connected your account, click the Use Account Global button below it to see your metrics. 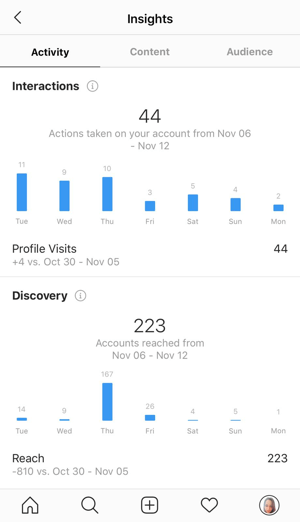 In the account overview section, you’ll see the cumulative number of your posts, engagements (likes and comments), and followers. 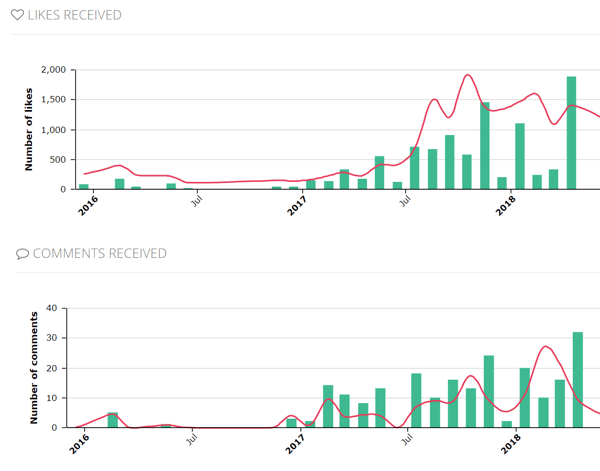 You’ll also be able to view a chart showing follower growth over time. If you want to track your metrics over a longer period of time, go to the Monthly Analytics section in the left-hand menu. Here, you can view the number of likes and comments you received compared to the previous month, along with a monthly follower growth chart. Finally, head over to the Engagement section to see the evolution of the likes and comments you’ve received over time. Another way to measure the effectiveness of your Instagram marketing is to monitor brand mentions to find out whether someone quoted or responded to your thought-leadership content. 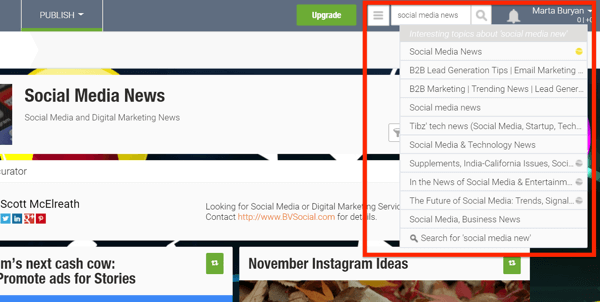 You can track brand mentions across the Internet using Google Alerts; just follow the steps discussed before. Tracking brand mentions on Instagram specifically is trickier because the platform doesn’t offer any statistics on your overall number of mentions. To see this type of data, you’d need to invest in a mention tracker, such as Mention (subscriptions start at $29/month). 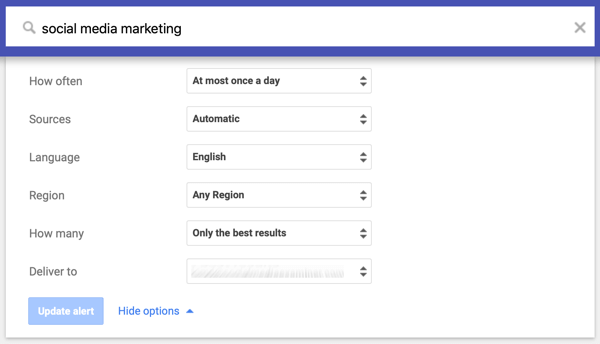 Still, there is a way to see a list of your brand mentions for free using Google. In the Google search bar, type site:www.instagram.com to limit your search to the platform. After that, add “@YourCompany’sInstagramHandle”. Make sure to include the quotation marks! 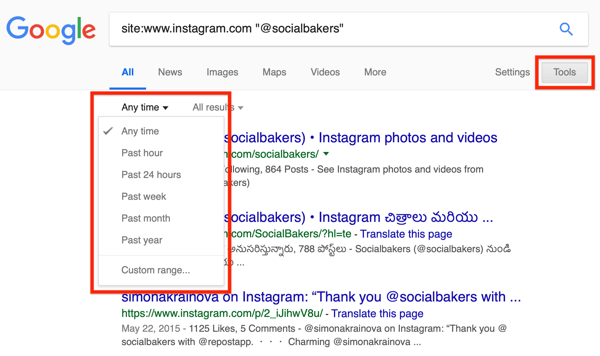 In your search results, you’ll see a list of your company mentions on Instagram, which you can further narrow by time range. The third way to assess the effectiveness of your Instagram strategy is to track the usage of your branded hashtag. It will help you understand how well your hashtag is resonating with the Instagram community and how often people are using the hashtag to talk about your brand. To see the overall volume of posts tagged using your hashtag, tap the magnifying glass icon at the very bottom of the Instagram app. Then type your hashtag into the search bar. 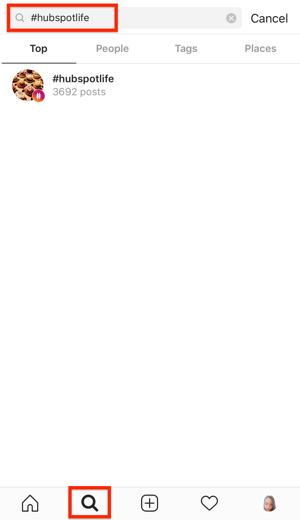 The number of posts will be displayed below. For more detailed insights into your hashtag statistics, check out the paid Instagram analytics platform SmartMetrics. For $9/month, SmartMetrics lets you monitor a number of granular hashtag performance metrics, including reach, impressions, sentiment, number of users who used the hashtag, and more. 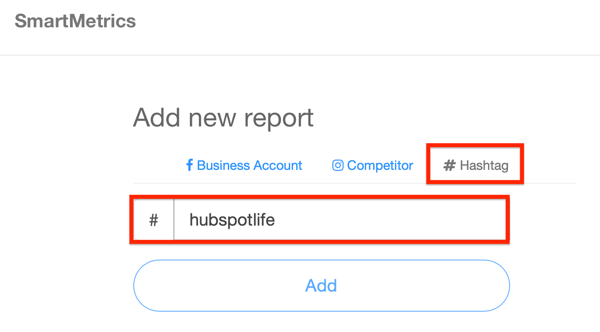 To track the performance of your hashtag, you need to set up a report. To do that, click the # Hashtag tab, type in the hashtag, and click Add. 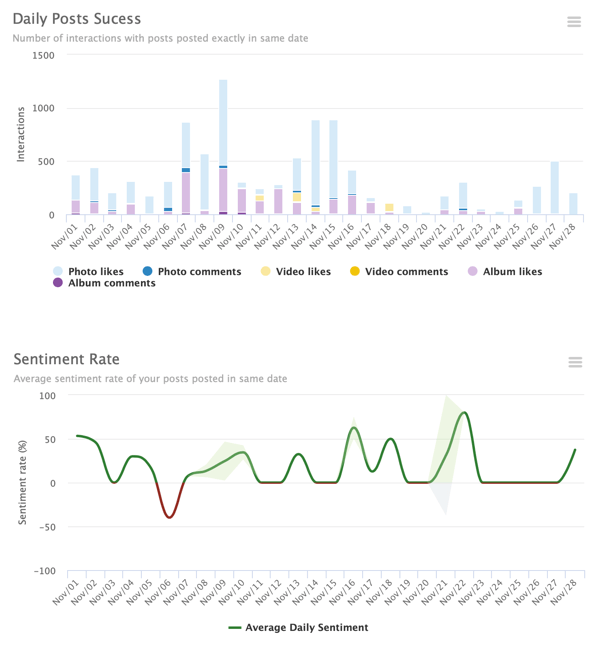 You’ll instantly see a dashboard presenting your hashtag’s performance metric in the form of visual charts that you can adjust by date range. Each chart gives you a detailed picture of the way your hashtag is used, so you know whether your branded hashtag is successful. Instagram can be a powerful marketing channel for your B2B company, allowing you to build brand awareness and engaged communities. To be able to unlock Instagram’s potential, you need to develop effective content strategies centered around thought leadership, news curation, success stories, and employee advocacy. What do you think? Are you building an Instagram presence for your B2B? What Instagram content do you publish to meet your business objectives? Please share your thoughts in the comments below.